Leinster produced a strong finish to send defending champions Glasgow crashing to a third defeat in their five Pro12 matches this season. The Warriors led 13-6 at the break, Zander Fagerson going over for a try with Duncan Weir and Leinster's Fergus McFadden kicking two penalties apiece. Luke McGrath and Taqele Naiyaravoro swapped tries in the third quarter. 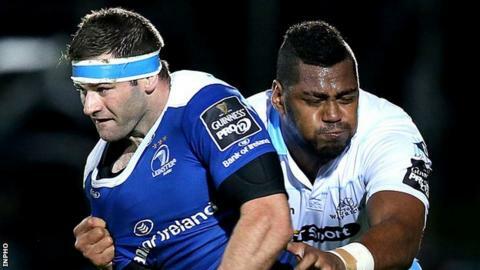 With winger Naiyaravoro sin-binned, Leinster edged ahead with a penalty try and McFadden landed a late penalty. The visitors, boosted by six returning Scotland internationals and seeking a first away win over Leinster since 2011, broke the deadlock in the 13th minute, with a multi-phase attack that finished with the 19-year-old prop Fagerson muscling over from close range. Weir's conversion was quickly followed by McFadden's first successful penalty. A second right-sided kick from the winger closed the gap to one by the 21st minute, rewarding Aaron Dundon for a well-won ruck penalty and accurate line-out throw in the build-up. Weir then punished Leinster for collapsing an advancing maul, punching over a fine 43-metre strike. He repeated the trick from the opposite left wing as Mike McCarthy infringed at a maul six minutes before the interval. Leinster missed a chance to close out the first half with a third penalty, McFadden wobbling an injury-time effort wide after Pat MacArthur saw yellow for a 'reckless' forearm-led tackle that ended Dundon's involvement in the game. The home side made their numerical advantage count on the resumption. Scrum-half McGrath's blindside switch led to Garry Ringrose racing up the right touchline and following a bout of forward pressure, McGrath stretched over for McFadden to convert. Leinster were only level for six minutes, the Scots hitting back with a terrific spell of attacking and a power-packed finish to the right of the posts by big Fijian Naiyaravoro. But the hosts took the lead for the first time through the penalty try. Replacement Isaac Boss exploited a gap and Isa Nacewa's well-weighted kick set up a foot race between McFadden and Naiyaravoro. The latter was deemed to have deliberately slapped the ball over the end-line as the pair lunged for the ball. After consulting with the TMO, referee Ian Davies awarded the penalty try and sin-binned the Fijian, with McFadden's conversion splitting the sides on the scoreboard. Leo Cullen's men saw out the result with McFadden nailing his third penalty of the night. Leinster: Nacewa, Ringrose, Te'o, Reid, McFadden, Marsh, L. McGrath, Bent, Dundon, Moore, Molony, McCarthy, Ruddock, van der Flier, Conan. Replacements: Kelleher for Nacewa (75), Boss for L. McGrath (58), Dooley for Bent (50), Tracy for Dundon (40), Furlong for Moore (50), D. Ryan for Ruddock (70). Not used: Leavy, R. Byrne. Glasgow Warriors: Lamont, Naiyaravoro, Vernon, Lyle, Hughes, Weir, Blair; Allan, MacArthur, Fagerson, Swinson, Cummings, Harley, Favaro, Wilson. Replacements: Hart for Blair (69), Yanuyanutawa for Allan (68), K. Bryce for MacArthur (58), Cusack for Fagerson (58), Ashe for Swinson (28), Peterson for Cummings (71), Blake for Favaro (50). Sin bin: MacArthur (40), Naiyaravoro (64).